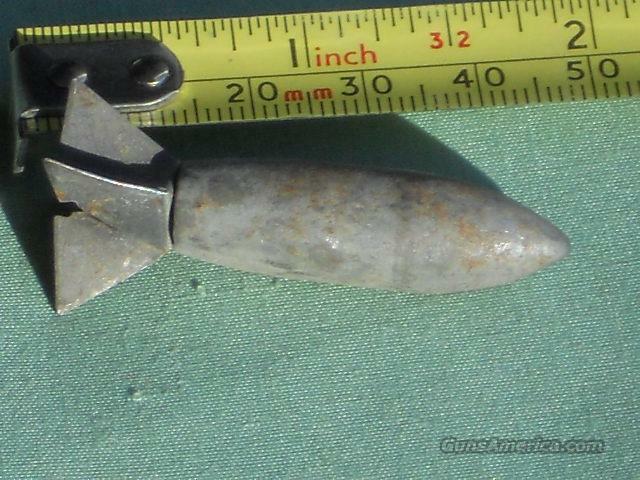 Description: Lazy Dog "bombs" (sometimes called Red Dot Bombs or Yellow Dog Bombs) were small, unguided kinetic missiles, each measuring 1.75 inches (44 mm) in length, 0.5 inches (13 mm) in diameter, and weighing 207 grains, about 0.47 ounces (13 g). The weapons were designed to be dispersed over the battlefield with Mark 44 cluster adapters. Lazy dog bombs were technically not bombs because they used no explosive, but were in many ways equally destructive. Mark 44 cluster adapters were one of many possible means to deliver "Lazy Dog" projectiles. Lazy dog bombs were descended from projectiles of almost identical design and appearance that were originally developed early in World War II as early as 1941. The Korean War-era and Vietnam War-era "Lazy Dog" was further developed, tested and deployed into the 1950s and 1960s. Experimental LAZY DOG projectiles of various shapes and sizes were tested at Air Proving Ground, Eglin AFB, Florida, in late 1951 and early 1952. An F-84 flying at 400 knots and 75 feet above the ground served as the test bed while a jeep and a B-24 were the targets. The result was eight hits per square yard. Tests revealed Shapes 2 and 5 to be the most effective. Shape 5, an improved basic LAZY DOG slug, had the force of a .50 caliber bullet and could penetrate 24 inches of packed sand. Shape 2 could penetrate 12 inches of sand — twice as much as a .45 caliber slug fired point blank. The rationale for using lazy dogs in the Vietnam War was because they were highly effective against enemy troops hidden beneath the jungle canopy. The munitions were also cheap and easy to scatter over large areas. Like many other weapons, however, their effects were often gruesome and indiscriminate. "Lazy Dog" projectiles were also referred to by other names such as "lawn darts" or "buzz bombs" because of their similar shape to both those objects. Lazy Dog projectiles were dropped in very large numbers, and usable with almost any kind of flying vehicle. They could be hurled from buckets, dropped by hand, thrown in their small shipping bags made of paper, or placed in a Mark 44 cluster adapter—a simple hinged casing with bins built in to hold the projectiles, opened by a mechanical time delay fuse as shown. The adapters themselves were 69.9 inches long and 14.18 inches in diameter. They would be shipped empty, then filled by hand. Depending on how many projectiles could be packed in, loaded weight varied between 560 and 625 pounds, with the theoretical maximum number of projectiles listed as an astonishing 17,500. Regardless of how they were released into the air, each "Lazy Dog" projectile would develop an incredible amount of kinetic energy as it fell, penetrating nearly any material upon hitting the ground. Some reports say that their speeds often exceeded 500 mph before impact.